When Judah’s King Ahaziah was killed (841 BC, Theile), his mother, described as “the wicked Athaliah” (2 Chron. 24:7) usurped the throne and reigned 6 years. She did the unthinkable: she killed all of Ahaziah’s sons–her own grandchildren! Of course, she was the daughter of Ahab and Jezebel, and she certainly and consistently played the part. Little known to her, the High Priest Jehoiada and his wife Jehoshabeath (Ahaziah’s sister) saved the one-year-old baby Joash, and kept him hidden for six years (2 Chron 22:10-12). 2 Chronicles 23 tells how Jehoiada led the priests, Levites, and people of Judah in crowning Joash as the rightful heir to the throne of David. At the same time, Athaliah was executed. Joash reigned 40 years (835-796 BC). The historian says, “And Joash did what was right in the sight of the LORD all the days of Jehoiada the priest” (2 Chron. 24:1-2). The Priest Jehoiada was no doubt a great mentor to the young Joash. Faithfulness on the part of Joash was seen during the rest of Jehoiada the Priest’s life. Great emphasis is given on the work of restoring the temple in Jerusalem (v.4), the house of God, “to repair the house of the LORD” (v.12). 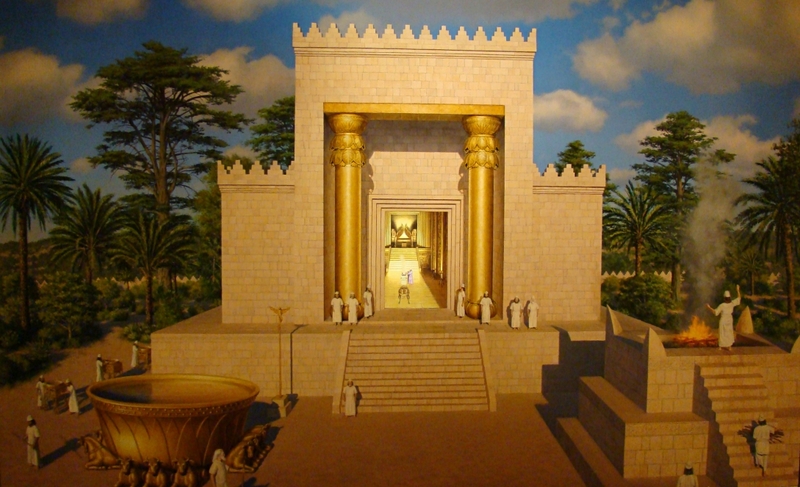 Painting of Solomon’s Temple. Semitic Museum, Boston. Photo by Leon Mauldin. The text goes on to say, “So the workmen labored, and the repair work progressed in their hands, and they restored the house of God according to its specifications and strengthened it” (v.13, NASB). The NIV translates, “The men in charge of the work were diligent, and the repairs progressed under them. They rebuilt the temple of God according to its original design and reinforced it.” All of this sounds so encouraging. Joash’s story is one of the saddest in Chronicles. It describes a king who deliberately turned his back on God after he had received personal experience of God’s mercy and had initiated a religious reformation. (2 Chronicles, Tyndale Old Testament Commentaries. Kindle Locations 3609-3610). But after the death of Jehoiada the officials of Judah came and bowed down to the king, and the king listened to them. 18 They abandoned the house of the LORD, the God of their fathers, and served the Asherim and the idols; so wrath came upon Judah and Jerusalem for this their guilt. 19 Yet He sent prophets to them to bring them back to the LORD; though they testified against them, they would not listen. 20 Then the Spirit of God came on Zechariah the son of Jehoiada the priest; and he stood above the people and said to them, “Thus God has said, ‘Why do you transgress the commandments of the LORD and do not prosper? Because you have forsaken the LORD, He has also forsaken you. '” 21 So they conspired against him and at the command of the king they stoned him to death in the court of the house of the LORD. 22 Thus Joash the king did not remember the kindness which his father Jehoiada had shown him, but he murdered his son. And as he died he said, “May the LORD see and avenge! (2 Chron. 24:17-22). What becomes apparent is that whereas King Joash did so much good, and seemed to be so strong, that when his real source of strength, Jehoiada, was removed, then what appeared to be faith and strength crumbled, showing his goodness to be only outward and superficial. Lesson: each one has to make the faith his own! (2 Tim. 1:5).